But there’s no other option but to live in an apartment or a dormitory near or in your school, so you don’t have to travel too long everyday. Not to worry. Even if it’s not where you grew up, you can turn your dorm into a home away from home. This starts with your dorm room. Keeping your things organized and touching your creative side will go a long way to making your dormitory feel like home. It will make you feel less homesick and more excited to live in a place with new friends. So here is a collection of easy, practical and creative ways to make your dorm room feel like a haven. 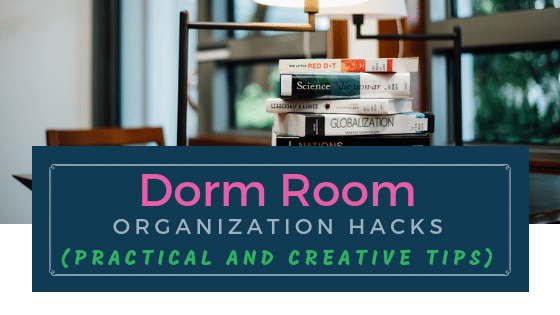 Check out these dorm room organization hacks! 1. 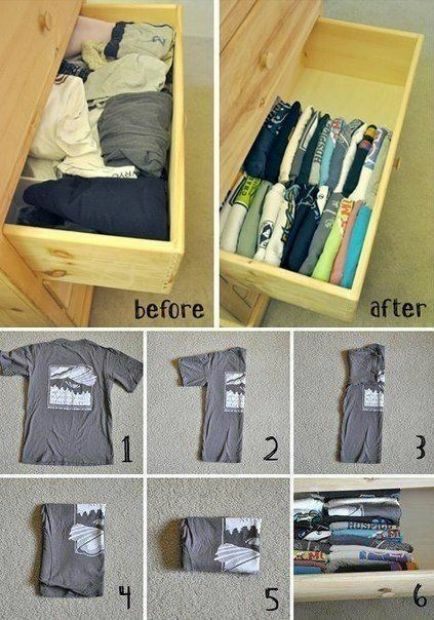 Fold your t-shirts strategically. But really, as much as possible, do you bring many stuff because you want to be sure that you have everything that you need? When you move from your home to a dormitory, you tend to bring your entire closet. You want to bring all your clothes with you to make sure that you have enough to weareven if you don’t go to a laundry shop for a week. Only to realize that the space for your clothes is not really as big as that at home. Well… if you fold your shirts like this, that’s one way to save on drawer space. Aside from creating more space for your other clothes, like shorts and pajamas, it is also easier to see your favorite shirts. You just might have enough space for everything. Oh well… not everything… but every clothing you need. 2. 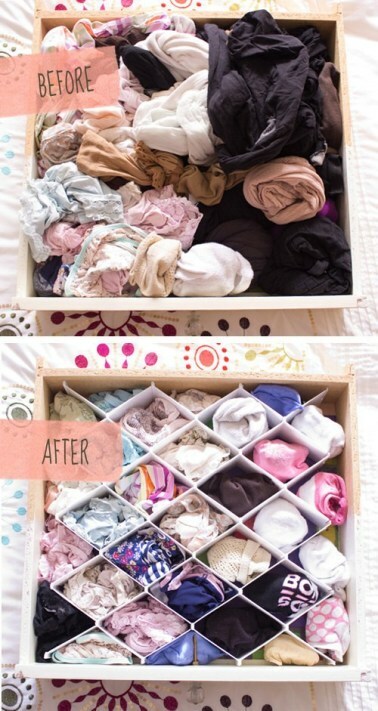 Create compartments in your drawer. You just learned a folding trick for your t-shirts to maximize drawer space. Now, you’re going to do the same with your undergarments, hankies, and socks. Well… not the same folding style, but these, like your shirts, need to be folded properly too if you want them to nicely fit in your drawer. But the thing is, when you put them only in one drawer, it tends to be chaotic. Like when you’re looking for your lucky socks. Good thing if it’s just on top. But if it’s at the bottom, you’re gonna have to rummage through everything just to find it. Why stick with this when all you need is to create compartments in your drawer? If you have some cardboard left, or shoe boxes, you can use that to create these partitions. Not only will this trick help you organize underwear, hankies and socks, but the next time you look for what you need, it won’t consume too much of your time anymore. 3. Double your closet space with a utility chain and S-hook. After ironing your uniform, blouses, and other clothes, you have to put them in hangers so they won’t get wrinkled. 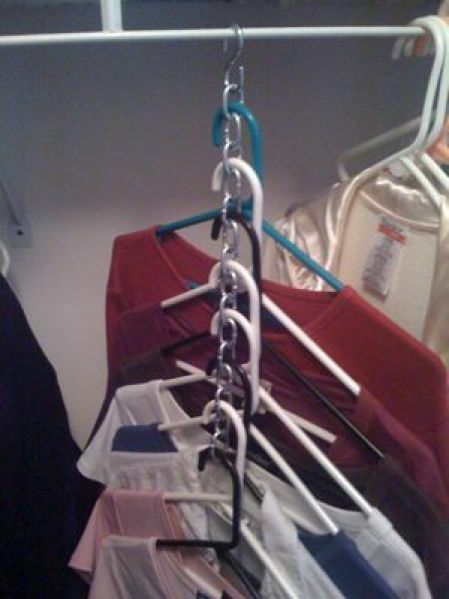 Stack your hangers by using a utility chain to hold them. This trick lets you hang more clothes, perfect to maximize tight spaces and tall closets. 4. Using pop tabs is also a great option to stack your hangers. Yes… from those canned juices and soda that you buy during break time! Don’t throw your cans just yet. Get the tabs first! 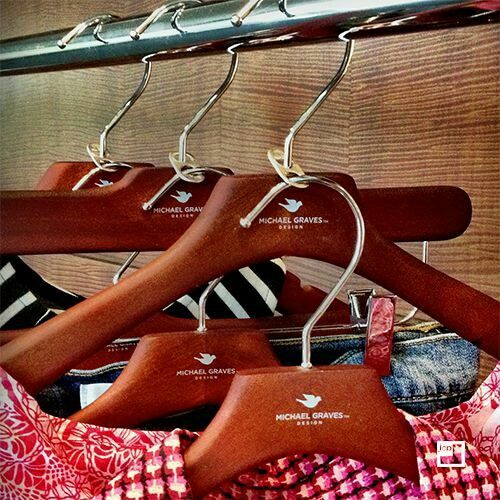 Collect them and stack your hangers with them. Now you’ve doubled your closet space again! What’s even more amazing is that you can apply some creativity in those pop-tabs. My sister-in-law did this when she was in a dormitory. She bought some nail polish to paint them. It just didn’t give her a colorful hanger stack, it gave her smoother pop tabs! Try it! Painting those is really fun! 5. 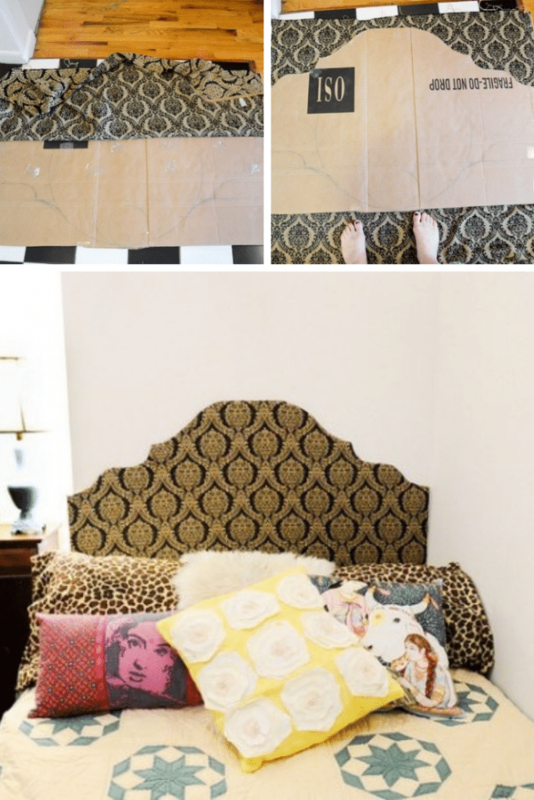 Create an improvised headboard. Use it to make an artistic and improvised headboard! Just cut it out to the artistic shape you want. Then cover it with any cloth that will blend in with the style and color of your room. Try it and have fun exploring your artistic side! 6. Fill the gap of your bed from the wall with pool noodle. It’s annoying when you drop your keys, powder, books, remote control and other things under the bed because of the gap to the wall. You have to crawl and search for them under your bed. So discomforting! Solve this immediately by getting a pool noodle to fill up that space between your bed and the wall. No more falling out of reach! 7. Have a bed caddy. If a pool noodle prevents you from dropping your things under the bed, a bed caddy helps you organize your things just on the side of your bed. This is very helpful for you to have your things just within reach especially when you just wanna lay down on your bed, grab your favorite book, wear your eyeglasses and start reading the next chapters. 8. Place a shoe organizer beside your bed. 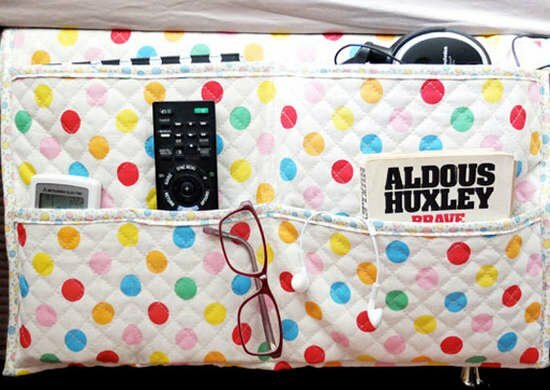 This is another organizer that you can place at the side of your bed – a place to store your shoes. Your space will be neat because there are no shoes scattered on the floor. This also keeps your shoes away from dust when they’re not in use. 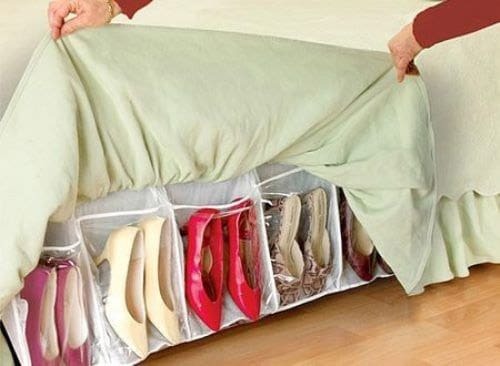 If you want the shoe organizer hidden, you can hide it under the bed skirt. Then it will look like those shoes aren’t even there! Okay… now maybe you are confused. What will I really put on the side of my bed? A shoe organizer? Or a bed caddy? If you want both, then that depends on the size of your bed caddy and shoe organizer. Maybe you can place them side by side? Or maybe the bed caddy is on the side of the bed, then attach the shoe organizer at the foot of the bed. Whatever is more convenient for you, do it. But don’t worry if you can’t have both. You have a lot more organizing options. Like the next one. 9. Hang your shoes & slippers at the back of the door. The back of your room’s door can be the new home of your shoes and slippers. 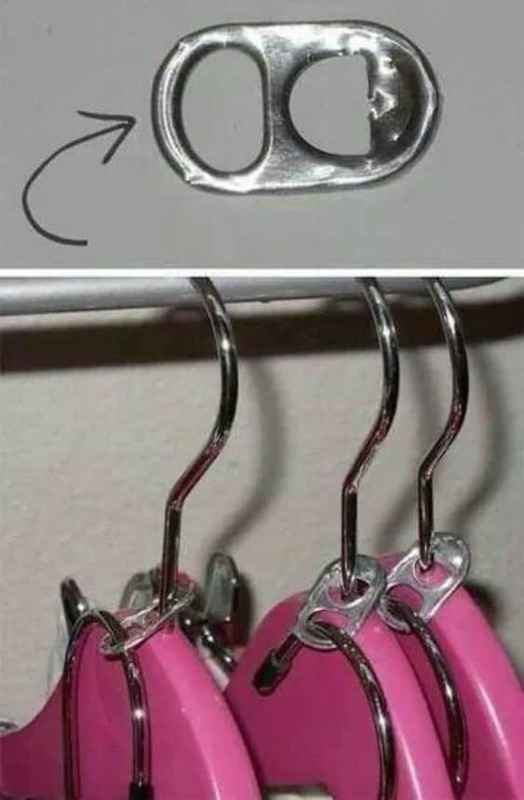 Just hang a shoe organizer and stuff your shoes inside. There are more ways to store your shoes nicely. Check out these two articles for more choices. When it comes to organizing your shoes, you will not run out of options. So just select which one best fits your space and your taste. 10. Use storage bins to keep your things under the bed. Get some storage bins and place them under your bed. This poses a lot of convenience because when you need to get something inside of the bins, just pull them out. It also makes the room more spacious. And because your things are inside the bins, that leaves your room looking organized and free from clutter! 11. Make your bed risers dual purpose. 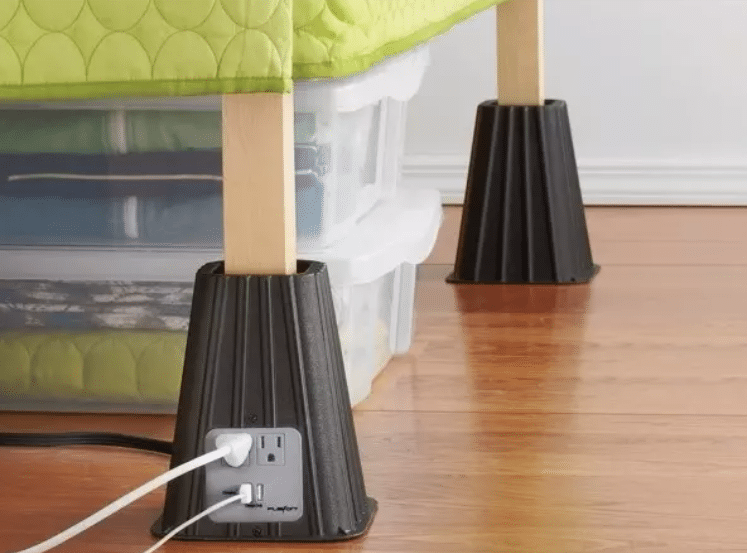 If your bed is not tall enough to maximize the space under it, investing in some bed risers can help. But if you’re going to buy one, do not just look for the typical bed risers that will only lift your bed. You might as well buy one that serves another purpose – charging your gadgets! Find one that has an outlet where you can plug your gadgets and charge them with ease. 12. Use washi tape to easily identify your smartphone charger. When you live with your roommates in one dorm room, you can easily mix up your things with theirs. Your mobile phone’s charger is one of these important things. 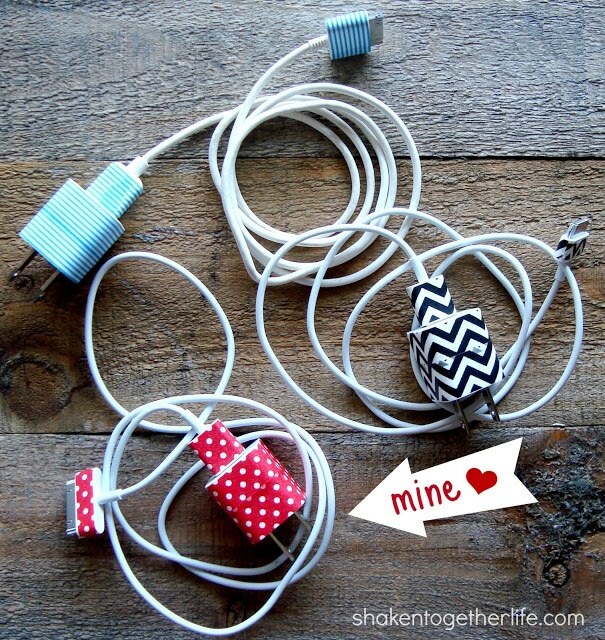 But when you use washi tape to cover your charger, it is easier for you to recognize which is really yours. And not only that, your charger will even look cute and beautiful with its new color! Who doesn’t want that? 13. Get some binder clips to make your digital life easier. Clip binders are not only useful for your files and folders. Come on! Let’s have our “inventiveness mode” on! What else can we do with these clips? 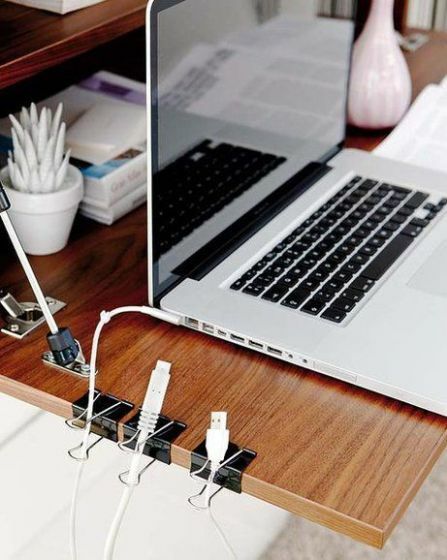 You can organize your cords and connectors with them! Common problem with these cords? They usually get tangled. Especially when you are having too many connectors for your gadgets – charger for laptop, USB cords, cable for your speakers. You want them all near you for easy access, of course, whenever you need to use them. So you put the cords all along on your desk. The result? Tangled cords and cables like Rapunzel’s hair. 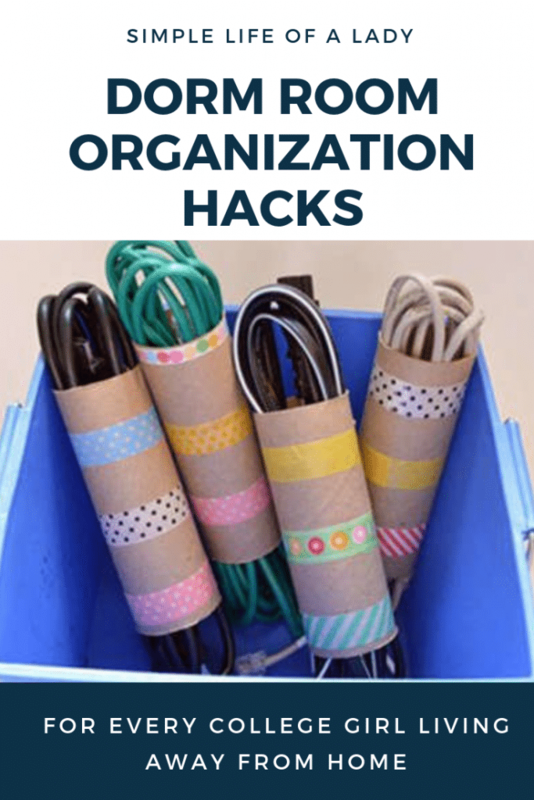 But… with the use of your binder clips (sizes vary depending on the size you need), you just clip them on your desk, then thread the cord through its wings and you INSTANTLY have your cord holder! Makes life a lot easier, doesn’t it? 14. Repurpose toilet paper rolls into an organizer. How do you keep your connectors? Do you just stuff them all in a box? No wonder they get tangled. The next time you keep your cords, get some of your toilet paper rolls and use them to hold your cords like this. 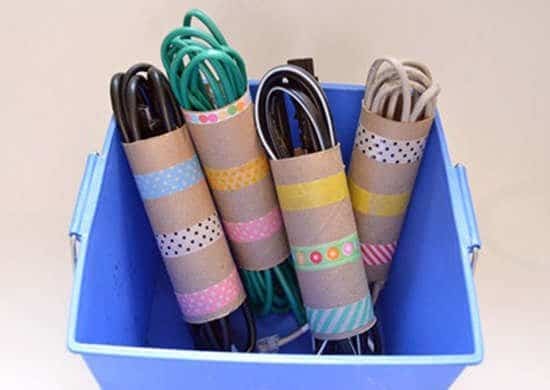 Then decorate them with your favorite washi tapes. So the next time you buy a bathroom tissue, don’t throw those rolled boxes just yet. 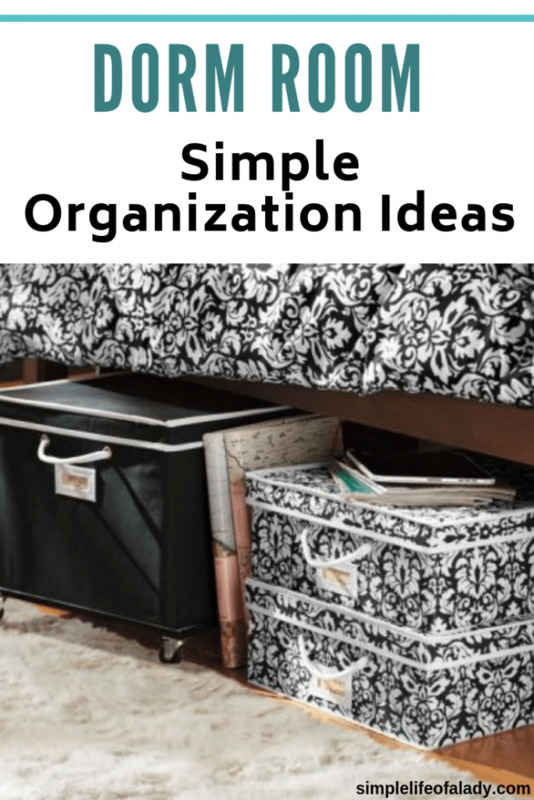 Turn them into these organizers! Not only will these help you in organizing, but will also ignite your creativity. More importantly, it surely will save you from spending your allowance in buying another expensive organizer. 15. 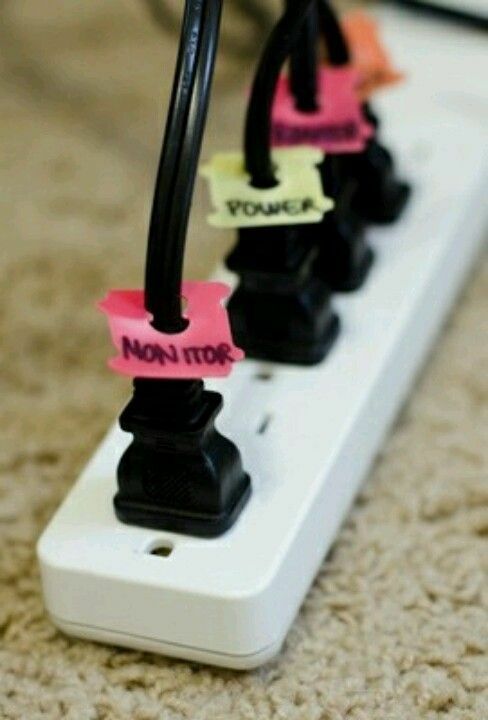 Use bread tabs to label cords plugged into a power strip. You are writing a very important research paper in your desktop computer. Black screen… your computer went off! When you turned around, you saw your sibling holding the cord to your computer. 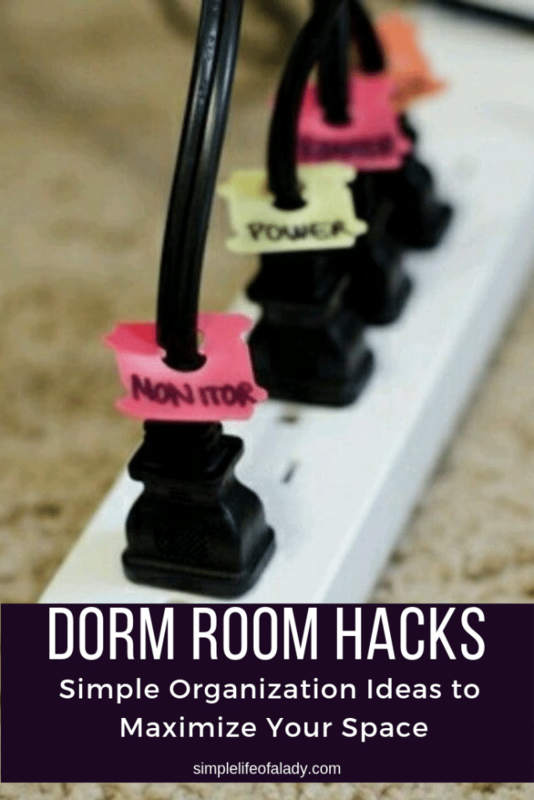 Even if you are just going to live by yourself, no brother or sister, no roommates who can unplug connections accidentally, it will be easier for you if your cords are labeled. You don’t have to make complicated labels. You can repurpose the bread tabs that you just throw when you’re done with a loaf. Instead of throwing them away, use them as name tags for every cord in your room – lampshade, computer, laptop charger, hair dryer and other equipment and gadgets you have. The next time you (or somebody else) unplug something, you are sure that it is the right cord! 16. Use rods to convert a tight corner into a storage area. Even the corners and the smallest spaces of your room can be useful. 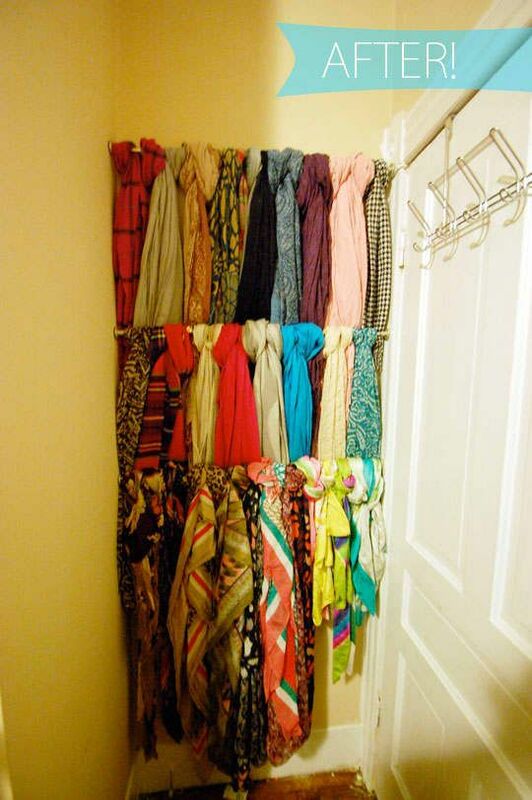 Use bracketed rods to arrange all your scarves. Make them easy to see and always ready especially during cold weathers. If you have fewer scarves, tension rods will do. Enjoy your room with your new friends. It’s so easy to get caught up with how you are suppose to organize your things that you may miss out on one of the best things in college – meeting new friends and forming new relationships! When you have roommates, or you have get together days like when you invite your classmates for sleepover, research work and group study during exams, your room can easily get messy. But that’s part of college life. What’s more important is that you spent time for these new friendships, some of which can last for a lifetime – even after you’re done with college. After all, you can always reorganize your things. This time, with the help of your new friends! 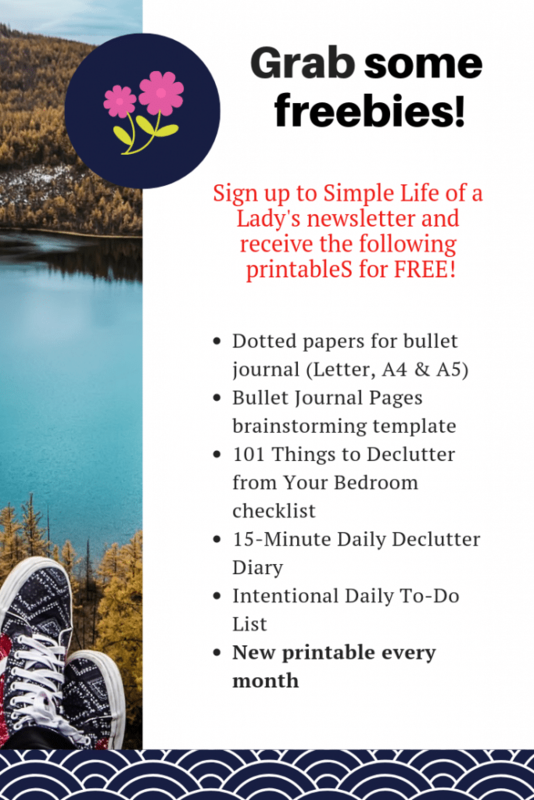 There are a lot more organization tips that you will find in this blog. These were originally intended for the home. But many of these can also be applied in a dorm room. Click on a link to see the post. Feel free to explore the site for more ideas that may pique your interest! Loved this post? Take a second to PIN it and let others know too!